Learn how to navigate the confusing world of online marketing with Amika Ryan (of DIY Sheep Crafts) as she provides an informative workshop for craft business owners. Let’s Play with Felting! Create a critter in our Felted Forest! Feel free to join (some fees may apply to participate) at any time throughout the day, ask questions, watch, learn, teach or simply enjoy the company with other fiber enthusiasts! Each year we have a wide variety of activities for all age and skill levels! Please see below for the list of upcoming demonstrations and classes during our next annual event. Activities will continue to be added as they are scheduled. Rosanne Anderson of Elegant Fibers has been a fiber fan for "about a zillion years"! She raises her own small flock of non-lamb burger sheep, she loves to knit and spin, and is so very fortunate to have a willing husband who will build almost anything for her sheep and craft. Usually. (She once almost had him convinced she wanted to raise silkworms!!) She also enjoys all the prep work and is excited to see a year's worth of dirty growth turn into beautiful fluff! Rosanne attends various fiber conferences and fairs in order to keep current, look for new opportunities to learn, share her knowledge with others and just enjoy the ambiance of the fiber world! Rosanne has been locker hooking for many years and Pin Loom weaving is her latest passion because it requires a bit of concentration (at first), works up quickly, and is terrifically interesting in deciding what to do with all of these cute squares! Are you ready to make a scarf, put together a garment, table runner, blanket, or something else fantastic? Then come and learn the wonderfully versatile Pin Loom! Look forward to taking your weaving with you when you travel, on a car trip, while watching TV, or anytime you have a few minutes. Weave it firmly or do a delicate fabric, these little looms are very versatile and come in many sizes. You can crochet the weavlings together to make an afghan or just join the little "bumps" for a lacy, delicate wrap or scarf. This is a craft that goes quickly, for once you learn the warping, you'll fly through the little squares. You may even become so addicted you'll advance to the bigger "pin" looms – all easily transportable as their small cousins that we'll be using. Come and get a good start on your next project! Skill Level: Just the ability to follow step-by-step instructions and have a bit of patience in the beginning. Supplies Which Will Be Provided by Instructor: Each student will receive a loom, lots of yarns and threads to choose from, needles, a 20+ page handout of various hints, tricks, websites, etc., and plenty of encouragement and fun. There will be a $40 materials fee. Supplies Student Should Bring to Class: Pen/paper and scissors. Locker Hooking is a fantastic way to use up tons of stash or "questionable" yarn, wind up with a cushy, beautiful product, and experience the joy of almost instant gratification! Even ugly, scratchy fiber results in a beautiful, durable piece of art. While it is certainly not as intricate, detailed, or exacting as so much of our fiber art world, it provides a wonderfully relaxing experience. Artists can add to the basic instruction by incorporating strips of material, ribbons, etc., to reflect their own imaginations. This is a fiber art that goes quickly - students can actually see their progress as opposed to the delicate, ultra-fine garments lots of us never seem to get finished. Come, relax, enjoy, and get a great start on your beautiful project! We'll cover: Finding proper canvas, Edge preparation, Working with handspun, store bought, roving, etc., Cleaning techniques, Saving your muscles and nerves, Time consuming but lovely stitches to enhance the final look, and Various tips to give an exciting fiber masterpiece. Skill Level: Just a bit of patience! Supplies Which Will Be Provided by Instructor: Locker hook, Prepared canvas, Roving, Hand spun yarn, Binder yarns, Various "designer" yarns, Bound 28 page instruction book, and especially fun! There will be a $40 materials fee. What to learn to crochet? Learn the basics of crochet and how to read a pattern while making your own small nesting baskets! 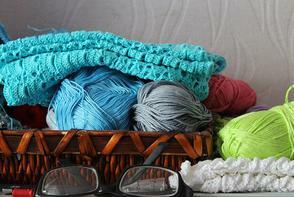 You’ll get all of the tools and supplies you’ll need to make 3 small nesting baskets in a variety of colors. Amika Ryan (of DIY Sheep Crafts) is your expert teacher for this fun and versatile crochet class and she’s looking forward to seeing you soon. Supplies Which Will Be Provided by Instructor: Complete crochet small nesting baskets kit including crochet hooks, fiber and pattern. There will be a $35 materials fee. Supplies Student Should Bring to Class: a smile! Join expert instructor, Amika Ryan (of DIY Sheep Crafts), in your exploration of wet felting on fabrics, and making a full-sized, light-weight wool and silk scarf of your own! • WET FELT ON sample swatches of silk gauze, silk organza, silk chiffon, cotton net, and pure wool fabric. • NUNO FELT a full-sized silk scarf with wool, silk, and Angelina fibers. Lot’s of fiber colors to choose from! Supplies Which Will Be Provided by Instructor: Complete nuno felt study and scarf kit including wool fiber and silk fabric. There will be a $35 materials fee. DIY Sheep Crafts and the Craft Box was founded by Amika Ryan. She is the owner of Copia Cove Icelandic Sheep. Amika has been shepherding for four years, and is a serial craft enthusiast! In addition to teaching fiber arts, she teaches handmade craft enthusiasts how to start and grow their profitable craft businesses. She is much loved and admired by her husband and her shepherdesses-in-training, Madison and Finley who reside with her in Butte, Montana. Do you love sheep and wish you could have some of your very own? Well, I can’t promise a real sheep, but these Needle-Felted Sheep Ornaments are the next best thing! In this three-hour fun and interactive workshop, you will create your very own festive and decorative needle-felted sheep ornaments. Choose from white, black, or brown local Montana wool from my own flock of sheep as well as locally sourced yarn to make your ornament. You will have time to complete one ornament in class and have the materials to complete an additional ornament at home, or in class if time permits. Additional kits may be purchased at a student discount price at the end of the class. Supplies Which Will Be Provided by Instructor: All materials and handouts are provided by the instructor. Class material includes everything you will need to make two sheep ornaments, which includes the fiber, felting needles, horseshoe nail legs, and felting foam. Additional material and full kits may be purchased at a discount at the end of class so you can continue to create additional members of your flock at home. Supplies Student Should Bring to Class: Students should bring themselves, a smile, and their creativity to design their very own masterpiece. Students will be provided a felting tool and needles to use during the class or they may choose to purchase their own prior to the class and bring them. Skill Level: Students should know how to cast on, knit, and purl. Supplies Which Will Be Provided by Instructor: This class includes a Goldieknots Intro to Cables Cowl kit which contains your locally grown, hand-dyed Goldieknots Montana Merino yarn, pattern, set of stitch markers, and project bag (a $46 value), as well as a mini resource notebook. Supplies Student Should Bring to Class: Students should bring a size 7, 16” circular needles and cable needle with them to class. She participated in the Montana Art’s Council’s MAP Program in 2016 and has taught fiber-related classes throughout the state of Montana. She is a member of the Montana Association of Weavers and Spinners, current member and past Secretary and Co-Chair of the Prairie Handspinners Guild in Billings, MT, a member and Secretary of the Lincoln Council for the Arts, and recently began the Lincoln Fiber Circle in her new home of Lincoln, MT. Prior to moving to Montana, Tammy lived in Southern California and the Pocono Mountains in Pennsylvania where she was a former Humane Education specialist for the SPCA. Her teaching style is fun, creative, and interactive, and when she’s not in her studio creating or on the road teaching, you can find her spending time with her dogs, sheep, horse, and other barnyard critters. Students will learn the basics of using a top whorl fancy stone drop spindle to spin yarn from processed roving and a carded batt. Students will get to choose their own fancy stone drop spindke,spindle, a braid of roving, and a mini batt in their favorite colors . We will learn to spin from roving and a batt of fiber during class, and students will have plenty of fiber to continue practicing their skills after the class is over. Students will learn as variety of tips and techniques to help them finish their newly spun yarn. Supplies Which Will Be Provided by Instructor: Each student will get to choose a fancy stone drop spindle , a braid of roving, and a batt of fiber to practice with in class and take with them. There will be a $35 materials fee. Supplies Student Should Bring to Class: The desire to learn a new skill. Anna Anderson's fiber hobby turned business, Calico Farm Fiber Arts, began more than 12 years ago with the rescue of 6 Pygora fiber goats. Shortly after, she was given a spinning wheel and introduced to fiber arts by her dear neighbor friend. Anna fell in love with fiber art and soon began the Wooly Rescue for fiber bearing animals. She also raises Pygora goats, Angora goats, and a variety of fine wool and long wool sheep. Anna continues to rescue fiber animals in need as well as an occasional horse or dog that needs a home. Anna and her family recently moved to St.Regis Montana and are in the process of setting up their 200 acre ranch with hopes of a venue, a maker studio and cabin rentals in the near future . Supplies Which Will Be Provided by Instructor: Complete wet felting kit and fiber for completing a project in class. Kit can be reused to create several more projects at home. There will be a $15 materials fee. Supplies Which Will Be Provided by Instructor: Reusable needle felting kit and all materials to complete 5 projects There will be a $15 materials fee.